Our Kidderminster store is a short drive off Junction 4 of the M5, between Kidderminster and Stourbridge. Once there, you'll find a vast selection of both freshwater and marine livestock. There are three seperately-filtered 2.4 meter-long coral bays; one for soft corals, one for long-polyped stony corals (LPS) and one for short-polyped stony corals (SPS). A great selection of tropical plants are kept in stock with dedicated tanks for bunched, potted and plants grown onto wood. R.O. water is also available along with pre-mixed salt water. A huge range of aquariums are on display including coldwater starter kits and tropical and marine setups. These can be found alongside our very popular and exclusive AquaOak range of aquariums. Our friendly and helpful staff are happy to assist you with all your fish-related needs. In our large outdoor area you will find an extensive selection of pond plants, pre-formed ponds and pond liners. Our 25-vat pond system holds a plethora of pond fish from the common goldfish to koi and sterlets. 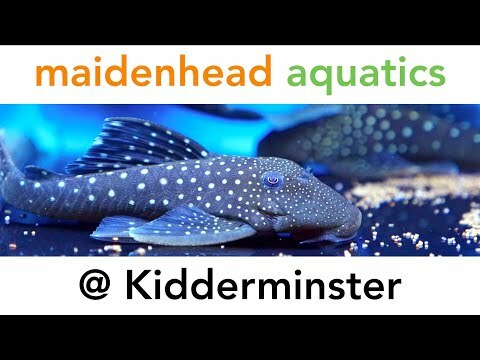 We offer an extensive selection of dry goods to suit everyone from first-time fish keepers all the way through to the experienced aquarist. If you can't find what you are looking for, then our friendly, expert staff will do their best to order it in for you.